“Scaling up Africa’s infrastructure to meet the MDGs” was unusual for three reasons. First, it was on infrastructure, a topic that is not usually associated with the MDGs, but—as the moderator Jeff Sachs pointed out—is central to meeting all the MDGs, either through its impact on economic growth, or through the effects of electricity, transport, and ICT on maternal and child health, for instance. Sadly, Fetlework Kidane passed away on September 14, 2010 of a car accident while on her way to work in Rochester, NY. Her body is being transferred to her hometown of Mekelle, Tigray, Ethiopia. The Internment will be held in Mekkelle in the presence of family, relatives and friends. We would like to thank everyone who helped us with finances, counseling and sharing our grief. Thank you also, for being at our side at this difficult time. This goes along very well with the Transformation Spirit in Ethiopia, transformation can only come if there is a paradigm shift in our thinking and approach to almost everything! What have been the successes and challenges of implementing the Health Extension Programme in Ethiopia? Addis Ababa, September 21, 2010 (Addis Ababa) - The Ethiopian Airport Enterprise (EAE) said it is to start providing free wireless internet service at Bole International Airport. In a press conference she gave here on Tuesday EAE Information and technology service acting head, Birhane Sisay said the service will be launched within a month. Eritrea has been deeply troubled since independence in 1991. Following the devastating war with Ethiopia (1998-2000), an authoritarian, militarised regime has further tightened political space, tolerating neither opposition nor dissent. Relations are difficult with the region and the wider international community. At African Union (AU) behest, the UN Security Council imposed sanctions in 2009 for its support of the Somali Islamic insurgency. 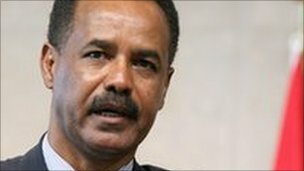 Ethiopia has accepted the border ruling and has been ready to engage Eritrea and its one man regime with the second stage of the process. The border issue is not and can not be the reason for the unimaginable misery the Eritrean people are facing today! I call this thinking outside the box. The approach to the solution is based on mutual respect and understanding. Define the core problem and establishing a sustainable, scalable and transparent process to achieve the expected measurable result. ..so I would like to express my support and gratitude to you personally and the prestigious Columbia University for inviting Prime Minister Meles Zenawi to give a speech on the current global economy and its impact in Africa. God bless you and long live the USA and Ethiopian friendship that my father saw and loved and dreamed about over 50 years ago. Columbia University Enables, That Truth Be Told About Ethiopia!! Song by a young upcoming artist Yared Berhe!! A festive night with Artist Temesgen Zegeye and other artists. Live in Conert Flyer Toronto!!!! The Tigrayan Community Association of Toronto cordially invites all! 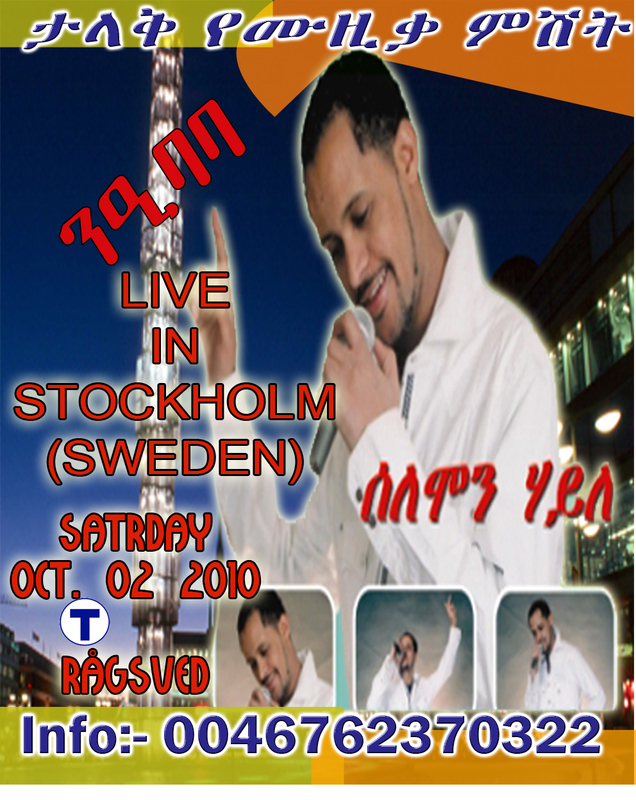 Solomon Haile in Stockholm Party!!! !